Carlsbad, San Diego occupies a 7-mile (11 km) stretch of Pacific coastline in northern San Diego County, California. Check out the Carlsbad, CA map for more details – all the maps you could need are right here – from live traffic maps to historic sites, trail maps and more. How far is Carlsbad from San Diego? 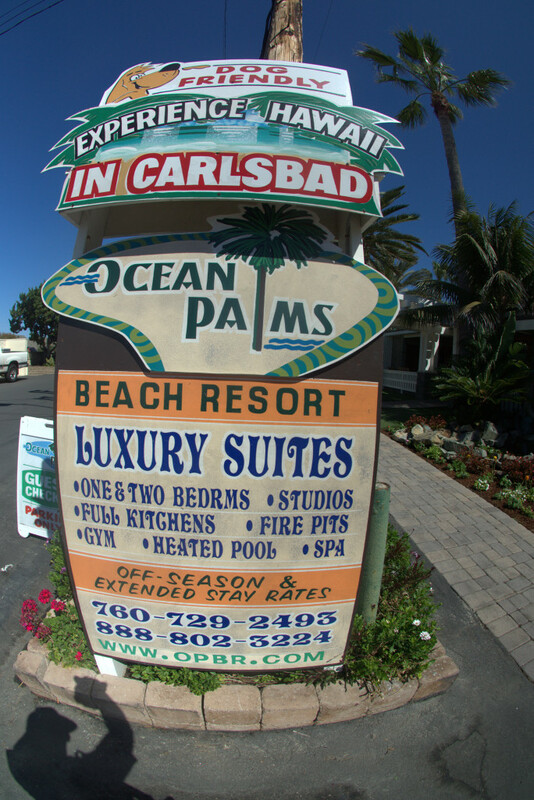 Ocean Palms Beach Resort is right across from the beach on Ocean Street. From Interstate 5, take the Carlsbad Village Drive exit, head for the beach, turn right on Ocean Street, and you are there. Easy peasy. We always say location is one of the most important things to consider when booking a hotel – it really can make or break a trip. 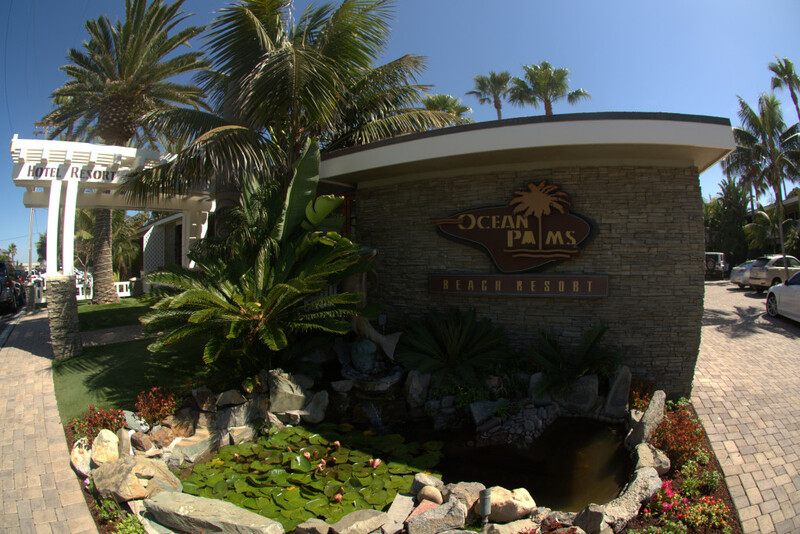 And we’re pleased to say that the location of Ocean Palms Beach Resort does not disappoint. 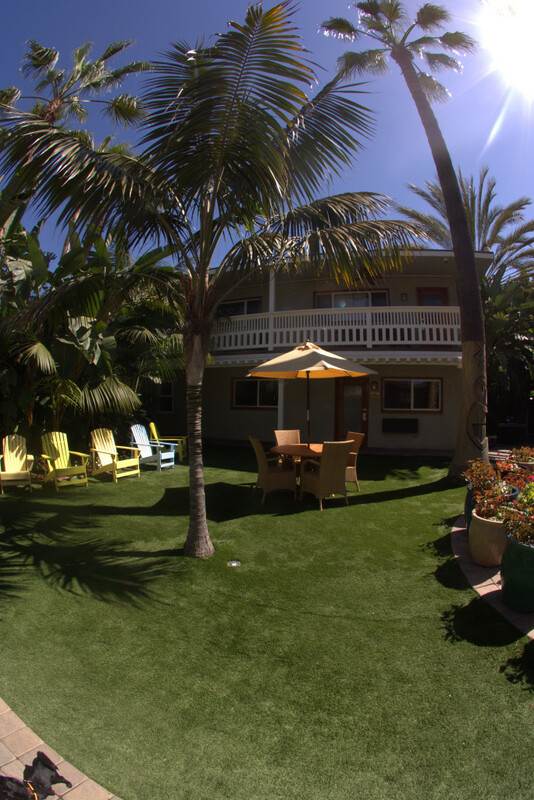 Positioned at the intersection of Ocean Street and Carlsbad Village Drive, this resort is just steps to the beach and walking distance to most major shops and restaurants in the area. We didn’t have to get in our car once during our entire stay (not to mention, we had a gorgeous ocean view) – now that’s some prime real estate. What was our first impression when we arrived? 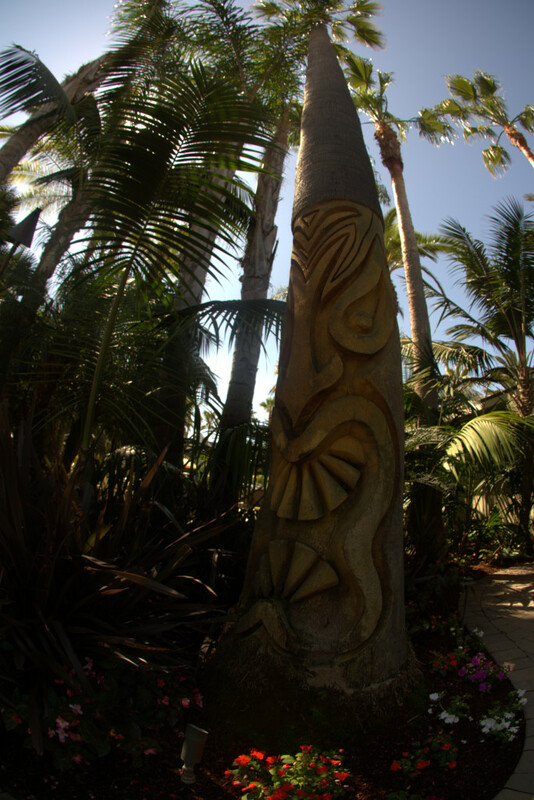 We loved the relaxed and charming atmosphere of the resort as soon as we arrived – from the gorgeous palm trees to the tikis and tropical foliage throughout the property, this Carlsbad beach resort felt like a little piece of paradise. Pour us some Lava Flows and we’d be ready to move in!! Easy and stress-free – just the way we like it. The resort was easy to find and signage out front helped direct us to the right place. Resort staff were very friendly and greeted us with a smile. They were relaxed and casual while still being professional. The Ocean Palms Beach Resort is a family owned business, and the staff takes great level of pride in providing quality customer service to guests. There was another couple in the lobby checking out as we checked in and they seemed disappointed to be leaving – always a good sign of a promising vacation, and the couple was right – it turned out to be one of the best places to stay in Carlsbad. 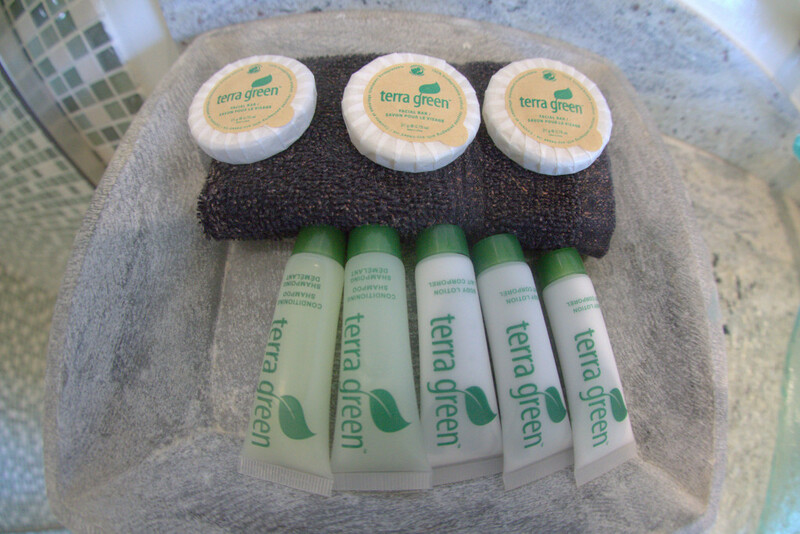 Were we offered a room upgrade or any other complimentary perks? We already had one of the best rooms in the resort – the Luxury Ocean View Suite. We were really pleased with the room and highly recommend it to other travelers, especially those with pets. How was the service throughout our stay? Service was great – we didn’t encounter the staff too often during our stay (we spent a lot of time out exploring the local area – Mishka loved being out on the town at all the dog friendly restaurants in Carlsbad ;)), but when we did, they were courteous, helpful and friendly. What was our first impression of our room? How was the view from our room? Gorgeous – the view of the ocean from our room was on point – we even saw dolphins swimming by while we relaxed on the couch with a glass of wine. It couldn’t have been more picture perfect! We also had a great view of the street below – we love how active Carlsbad is. Between surfers, skateboarders and friendly locals, there was some entertaining people watching! Bathrobe, slippers, and bath amenities? No bathrobe or slippers, but we honestly didn’t need them. Carlsbad is flip flop and bare feet territory. 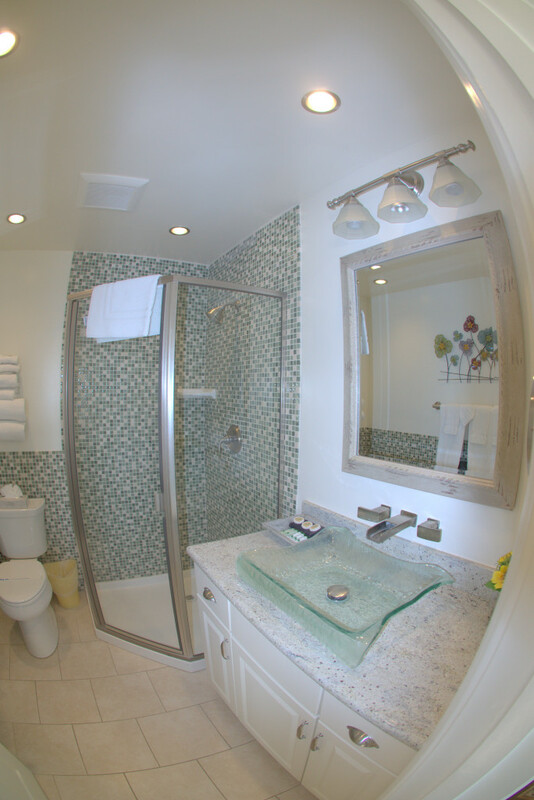 🙂 There was, however, a lovely array of bath products and a nice spa-like bathroom that had been recently remodeled. 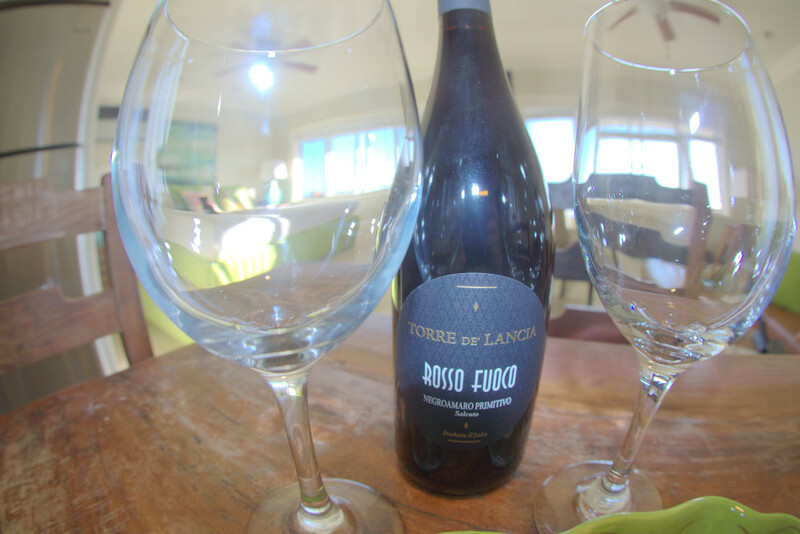 We loved that the staff left a complimentary bottle of delicious red wine waiting for us in our room – great way to kick-off our relaxing beach weekend in one of the best Carlsbad beach hotels! Cheers! 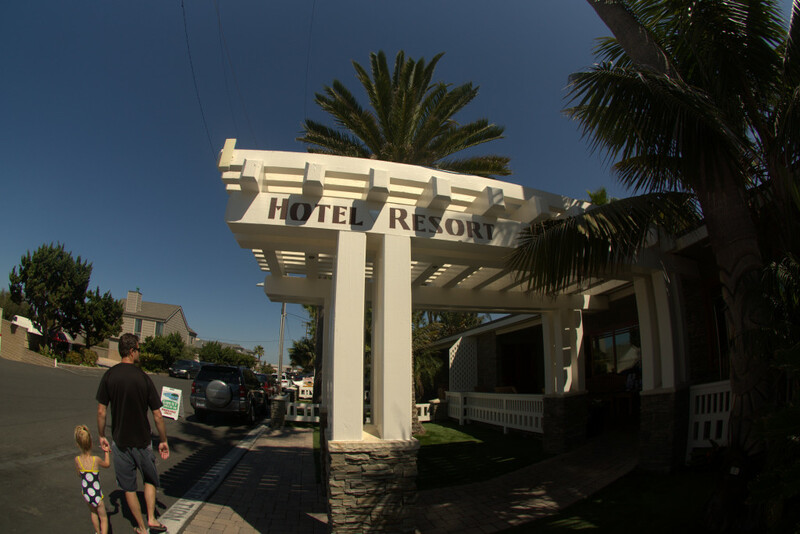 There’s no restaurant on property at this resort, but one isn’t really needed because the location is so close to all of the best restaurants in Carlsbad. 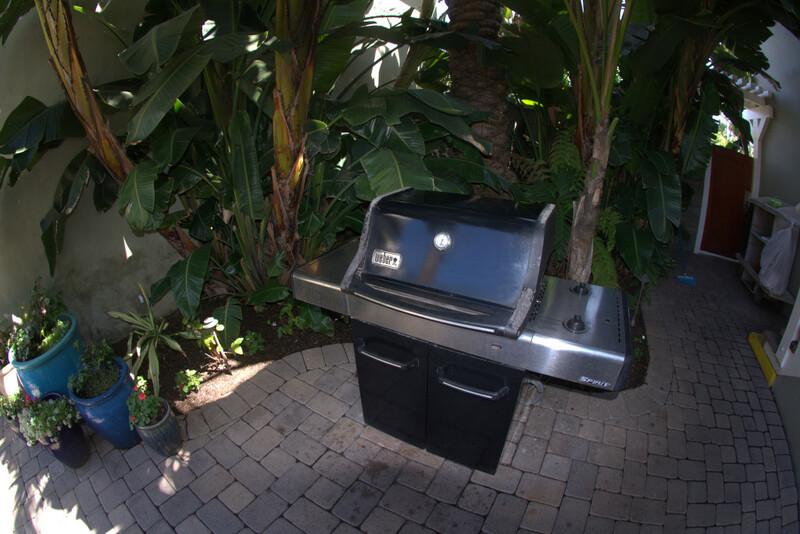 There are BBQ grills throughout the property for those who’d prefer to do their own cooking. 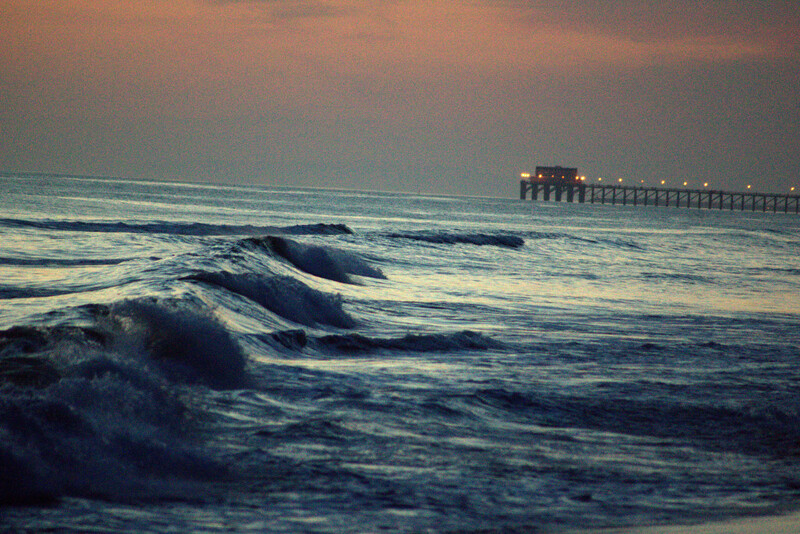 Grill up some burgers and walk across the beach to enjoy the sunset! Tables with umbrellas are available throughout the resort – great for enjoying a meal or relaxing with a good book. 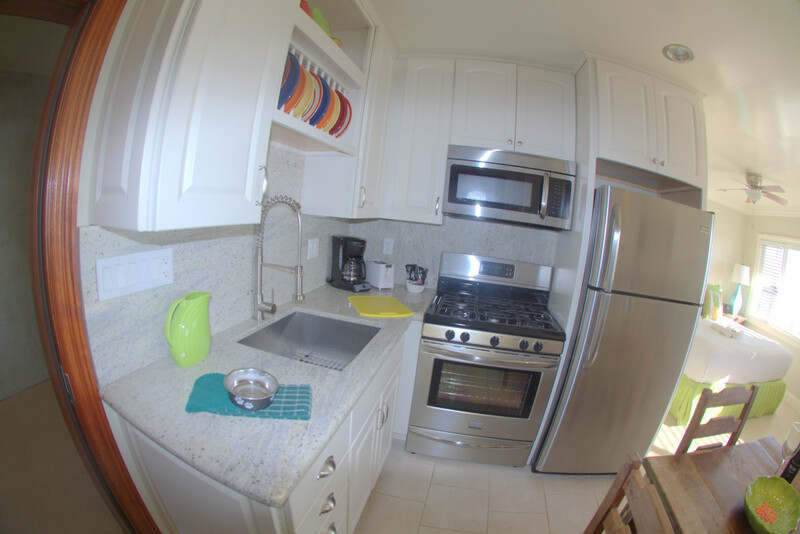 Our room came with a fully equipped kitchen – we didn’t use it, as we decided to indulge in the local dog friendly restaurants, but it was nice to have on hand. 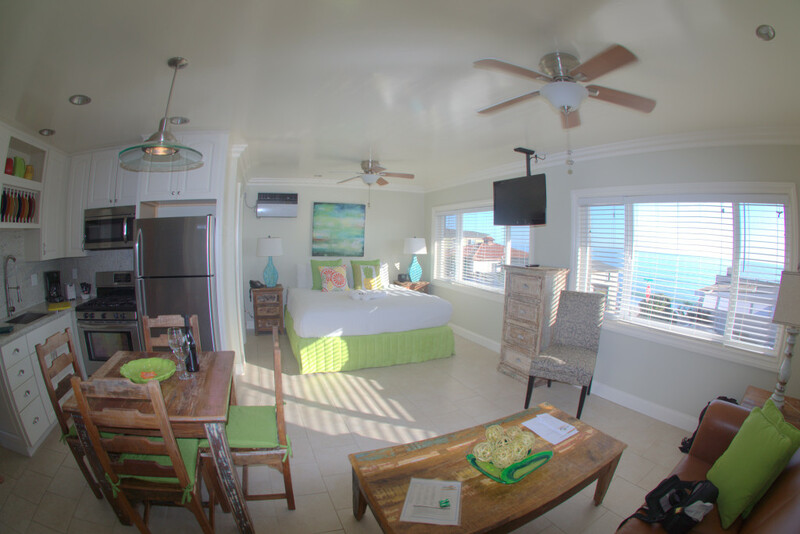 Check the nightly rates for the Luxury Ocean View Suite at Ocean Palms Beach Resort. Please note not all rooms are pet friendly and not all pets are accepted at the resort – call the hotel to confirm your pet can be accommodated before booking. Definitely! Great location for couples with (or even without) pets who want a fun place to relax and enjoy the charming, small-town community of Carlsbad. This could even be a great hotel for a romantic beach weekend for San Diego locals. Would we recommend it to a friend? 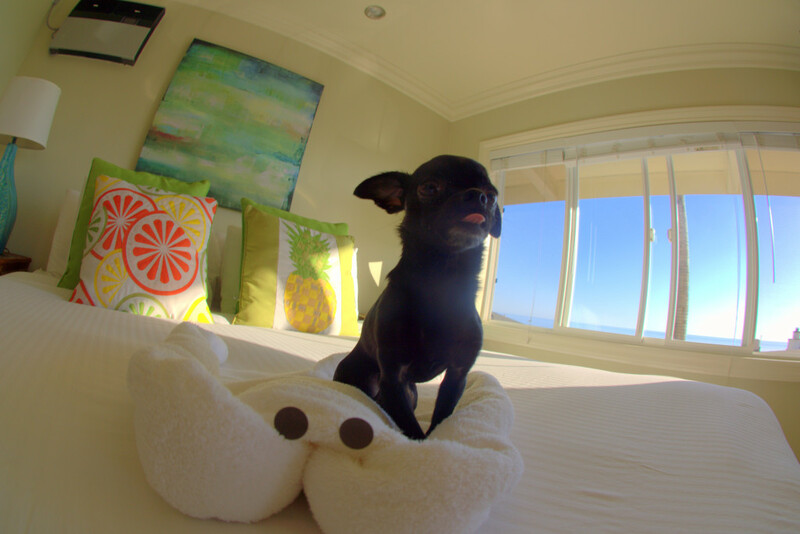 Absolutely – if you have pets and you’re looking for a hotel in Carlsbad, we highly recommend Ocean Palms Beach Resort. Not too long after our stay, Carlsbad was affected by some pretty terrible fires, and the staff at Ocean Palms Beach Resort generously offered up rooms at a discounted rate for locals with pets. We love pet friendly places who care about their local community, and this thoughtful gesture made us love this resort even more. We can’t wait to return – and we hope you’ll check it for yourself sometime too. Check the nightly rates and make your reservation. Keep us posted on how your stay is! Have you been to Carlsbad CA yet? What’s your favorite place? Tell us in the comments below! 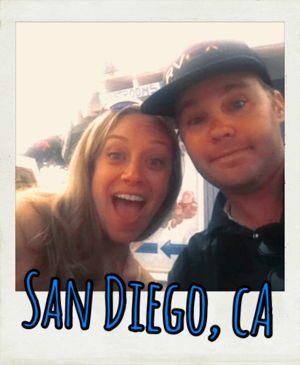 We love to hear what you think and discover the latest San Diego Hotspots with you!